I’m still spending the bulk of my day in a very un-photogenic place so I’m having a difficult time being creative with my shots. I’ll find a way to work around it soon but having the constraints forces me to look at things differently and try to pull a photo out. Not always successful. Not always interesting. Always a learning experience. I gave the post the same name as my photo today. I think that’s a first! I had to make a few corrections to the puzzle after I took this shot. I like to do them in pen and usually don’t commit to an answer until I’m really sure but sometimes I get tricked up. The New York Times puzzles get increasingly harder as the week goes on. I can usually breeze through the Monday and Tuesday puzzles, have a little difficulty on Wednesday, really have to dig deep on Thursdays and there have been some Friday puzzles where I barely even got started! 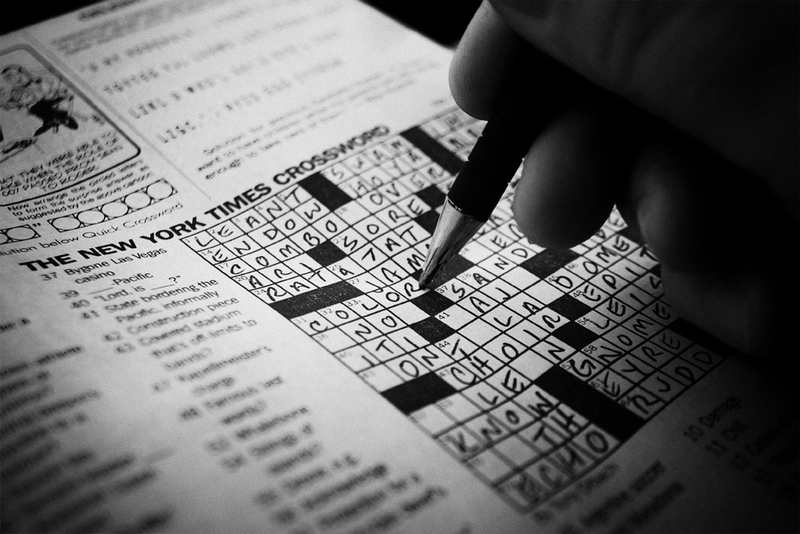 By the way, taking a self-portrait of yourself doing a crossword puzzle is an interesting shooting experience! Pentax K20D, DA 17-70.